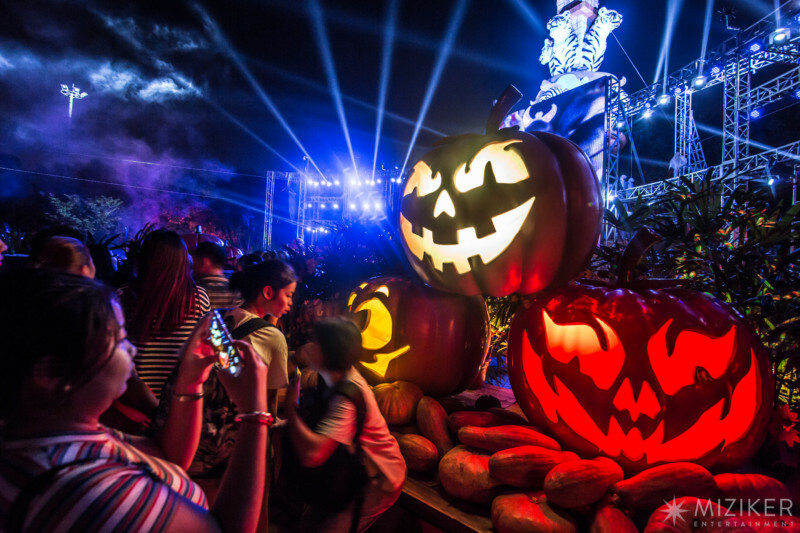 Guangzhou, China — Burbank, CA-based Miziker Entertainment produced and created a parkwide Halloween overlay for Chimelong Paradise, turning it into Chimelong Scare-adise. The event, which ran from October 13 and ends November 13, incorporates three new Halloween-themed attractions and three new Harvest and Halloween-Zones. “We were thrilled to work with Chimelong Paradise amusement park to customize and enhance their popular, annual Halloween experience with new, family-friendly features and thrills, helping boost attendance,” said Ryan Miziker, CEO and Creative Director, Miziker Entertainment. Under turnkey contract to Chimelong Paradise, Miziker Entertainment collaborated closely with park director John Smart and his team who have produced Halloween shows in-house for several years. Miziker Entertainment’s contribution consisted of three zone overlays – Pumpkin Harvest, Haunted Woods, and Scarecrow Alley – with large set pieces, lighting design, audio design, performers and projected media, a rapids ride overlay called Voodoo Bayou, and enhancements to two horror mazes. Miziker devised three levels of frights at the park – from Spooky for all-ages, to Scary for everyone over 10, to Terrifying intended only for those who dare. The project timeline was six months from first conversations to project delivery. Miziker’s three levels of frights at Scare-adise was indicated with graphics on the attraction map for guests, and with signage and color coding in the park itself – so that the park’s family and teen audiences could navigate accordingly. The dramatic Pumpkin Archway, celebrating both Halloween and the harvest season, provided a sense of arrival and was a favorite photo op. Themed environments included Scarecrow Alley, Haunted Woods, and Pumpkin Harvest. Themed attraction overlays included Voodoo Bayou, Zombie Train and Flashlight Maze. Technical components of each overlay were designed to facilitate quick installation in the existing space, teardown and storage and included point source speakers, projectors and lighting fixtures in addition to set pieces. As part of their turnkey project delivery Miziker Entertainment also provided costumes for the performers, media production, lighting design, sound design, custom background sound design and original music. Chimelong Group has established itself as an international leader in the theme park business, and has opened five theme parks. Chimelong Paradise, in Guangdong Province, was the second, opening in 2006 as part of a resort development. The park is 60 hectares in area, features more than 60 rides and attractions, and attracted nearly 4 million attendance in 2015.